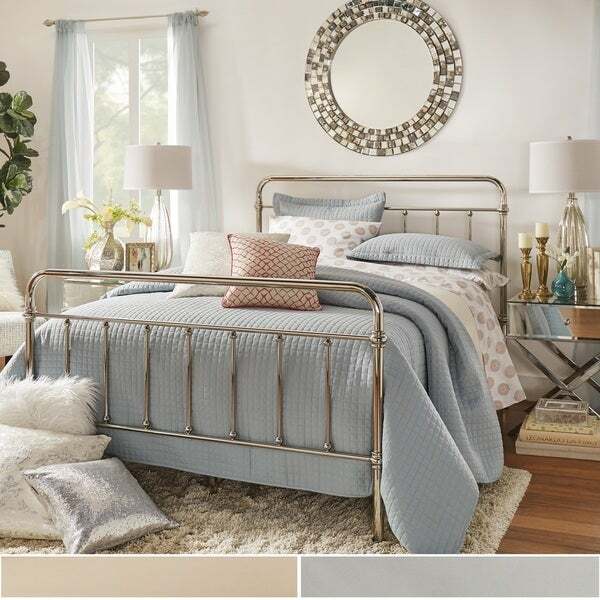 Add some glamorous style to your bedroom decor with this curved metal bed. With a slightly curved headboard and matching footboard, the look is not plain, it's just the right touch of design and shine. This bed is available in a champagne gold or chrome finish, and your choice of twin, full, or queen size. This product ships in two (2) boxes that may arrive on different days. The color in the photo looks gold, the actual bed is pure silver colored. "What is the weight of the queen size and the weight limit it can hold?" Unfortunately we do not test the weight capacity of products here at Overstock. "The review above says the gold looks like silver. Is this true?" This bed is available in both chrome and champagne gold options. The champagne gold is a lighter, pinker tone than traditional gold. "I want to bed this bed for a second room. Would you please tell me what box spring you have in stock that could go with it? I also want to know if the gel form mattress will go with this bed? Thanks." This bed works with any standard size mattress and box spring. "Does this bed require a box spring? And if so what height is best? I own a tempurpedic mattress and as such a box spring is not good, do you sell any alternative? " This bed does require a box spring. The overall height with the box spring and mattress is recommended to be about 13 inches or more, so that it will reach the bottom of the headboard.